Our Conran collection combines simple and contemporary to form perfect proportions. Showcased here is the Conran console grande with two good size drawers and classic simple antique brass handles. Black satin stain veneer body sitting atop a slim square iron frame finished in a matt black. 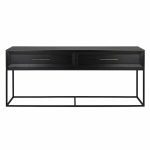 Conran has an airy but strong elegance and is the perfect Console for a modern or classic design scheme and sits beautifully behind a sofa or a long narrow hall.